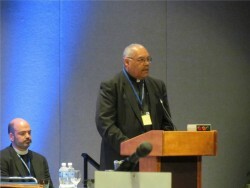 An astonishing event took place at the Northeastern Ohio Synod Assembly over the weekend of May 15-17, 2014 – I was elected Bishop! It is astonishing to me because never in a million years did I expect that would happen. When I agreed to allow my name to go forward it was purely a response to the leading of the Holy Spirit. I prayed, discussed it with my wife, consulted with colleagues whose opinions I value. They all said that I must remain open to the possibility. So I agreed, but it was an agreement entered into with the utmost fear and apprehension. I will write more about my feelings during the process in my next post. I wanted today to share my acceptance speech, which I wrote just on the off chance that I would be elected. I wanted to be prepared. Here is what I said to those gathered at the John S. Knight Center in Akron on the morning on May 17. Our faith teaches us that the Holy Spirit speaks through the Church. The Spirit has spoken. I am humbled by this moment. I am filled with awe and reverence at the affirmation you have given me throughout this seemingly endless two days of discernment. I thank God for all the candidates who were willing to go forward in this process. I pray that God will bless them as they continue to lead God’s people in the ministries that God has entrusted to them. I am also thankful for all those who have had a hand in one way or another in this process. The bishop election committee, the staff at the synod office, those representatives from the churchwide office. And I am especially grateful to Interim Bishop Marcus Miller, for the way he has diligently prepared all of us for this moment. I have had the privilege of observing him firsthand at synod council executive committee meeting and the very structured way he approaches everything. Bishop Miller has been a blessing in my life going all the way back to when he was elected Bishop in 1995 and I was council president at St. James Lutheran Church, now New Covenant Lutheran Church in East Cleveland, and we were searching for a Pastor. I spent a lot of time last night, answering a lot of texts, tweets, and Facebook messages. But most of all, I spent a lot of time in prayer. I also turned to God’s word for guidance, reading over and over the words of assurance he gave to the prophets. I pray that, as the Spirit empowers me, I will carry out the responsibilities of this call, trusting in God to provide me with wisdom to lead, vision to guide, faith to persevere, courage to love, and understanding to admonish. I accept this call and pledge that as insofar as I am able, I will make every effort to verify the confidence you have shown in my abilities to fulfill the duties of the office of Bishop to which you have elected me. I ask for God’s grace to strengthen all of us as we go forward in faith. When the Spirit calls, you have to move fast to catch up and you have my friend. It is an honor to have you as my friend. You will continue to be in my prayers. I thank our God for you!! May God continue to bless you abundantly! !